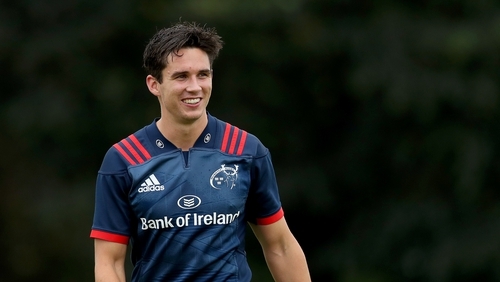 New Munster out-half Joey Carbery says he left Leinster to escape the shadow of Johnny Sexton and carve out his own career as a starting No 10. And the 22-year-old Irish international says he has no intention of returning to Leinster after Sexton has finished his playing days, and is instead keen to become a long term success in the red shirt for Johann van Graan’s side. Carbery looks set to make his first start this weekend as Munster host Ospreys at Musgrave Park, and on the back of two exciting appearances off the bench he is keen to nail down the starting 10 shirt before the Champions Cup returns. To date Carbery has only started one European tie at out-half – back in October 2016 when Sexton was injured – and the chance to show his wares in his chosen position was key to him seeking pastures new. "It was a tricky enough time. I suppose there were a few options given to me. I met with Johann after we played them in the RDS and I met with him again then," said Carbery. "We kinda just chatted. I felt it was the best option for me. Obviously I wanted to be playing more and kinda get out of the shadow of Johnny (Sexton). "I suppose I was learning so much, but I felt then that there is only so much you can learn from watching someone. The best way to learn is going out and doing it yourself and learning from your mistakes. "I feel like I took in a huge amount of knowledge from the people around me in Leinster, now I just need to implement it into my game. The only way I can do that is out of the pitch. "Definitely (this is home now), I don’t want to be chopping and changing and having to move and stuff. At this moment in time I’m very happy seeing myself here for a while. Yeah, I’m pretty happy with it." With the World Cup less than 12 months away now, Carbery seems to be happy to have the chance to cement his place in that squad, and perhaps even challenge Sexton for the starting 10 shirt. He says the chance to play alongside Ireland scrum-half Conor Murray on a regular basis with Munster was a factor in his decision. On Monday Munster took the move to clarify that Murray is currently sidelined with a neck injury, although van Graan had no further update, while Carbery admitted he is looking forward to lining out beside him again. "A good nine inside you makes my job a lot easier. There’s a load of good nines in Munster but obviously Mur (Murray) has proven he’s one of the best in the world, if not the best in the world, so it will be great to play with him. "When I’ve played with him in Ireland it’s been really good so looking forward to playing with him. "I want to be humming and ticking by the time that (World Cup) comes. But the big thing for me was just getting the game time. It's tough sitting on the bench all of the time. It's tough, all you want to be doing is going out there and playing because you work hard during the week. I suppose that was a big indicator as well. "I wouldn't say I was a victim (of my own versatility) but being able to play a few positions, the team always comes first. I was happy to do what I needed to do but I suppose I want to be playing 10. I feel like that's where I'm best at and that's where I can develop the most at. I wanted to take the selfish route and that's what I want to be. I suppose that's what made me (move). "It makes my job a bit easier (if I play 10). I can focus then on the core skills that I need to work on rather than worrying about two or three other positions that I need to cover. "Like I said, my favourite position is playing 10. When I'm playing 10, I feel like I am at my best, so that was the main reason." Before that opening European Champions Cup game against Exeter Chiefs comes around, Carbery is likely to lead Munster’s charge on the Aviva Stadium where his former teammates in blue await. The youngster is well aware of the welcome that awaits him, but he is eager to try and pick apart Leinster’s game plan with Sexton at the helm. "I suppose it will be strange playing against a team I used to play for. We just have to treat it as another game. At the end of day, it's a game of rugby, so we have to go out and try and beat them and get more points than them. "It will be exciting obviously, going back up to the Aviva and stuff and going into the other dressing room. I think it's going to be a real test of where we are in the season. It's going to be a big game. It's always a big game, there is always a massive between the two. "(Before I left) I wrote into the Leinster WhatsApp group just to tell them my decision and why and they took it really well. They said we’re still going to be mates, which is great. Obviously I then left the WhatsApp group. I’m not going to stay in and try and creep on them! "I’ve still best mates back in Dublin and talk to a good few of them regularly and whenever I’m back in Dublin I meet up with them for coffees so I don’t think anything’s changes, I just don’t see them on a daily basis."